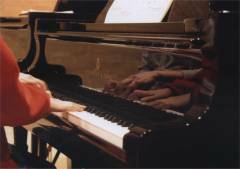 Attend an informal or formal CSYM piano concert. These are free of charge and open to the public. Parents with young children should plan to attend for only the first half of the concert and feel free to leave if children become restless. Please contact the teachers for details of scheduled concerts. A brief review of the basic principles of Suzuki education. Discussion of the preparatory stage, i.e. setting up the home listening environment, guidelines on choosing a piano, acquiring a foot-box and appropriate piano stool or bench, scheduling a term or more of lesson observations and arranging a module of parent lessons. Parent lessons are scheduled with the teacher before the student begins to discuss the principles of Suzuki education in more detail, e.g. the role of listening, how to practise at home, the use of the Suzuki books and music-reading. New student lessons commence when the teacher is ready to start a group of three young beginners, OR is able to overlap a new beginner with another student. New students usually begin in September or January. Openings vary throughout the year depending upon the teacher's schedule. Whenever possible, the teacher schedules lessons to create the optimum learning situation for each child in the programme. Parents are asked not to request specific days or times, as it is impossible for lessons to be arranged according to individual needs or preferences.